I think ... that this is a new phase for me. Mark McCumber once confirmed to a golf writer that he was an excitable sort. How excitable? “Perhaps an 11” on a scale of one to 10, he said. What he pulled off in 1988, winning THE PLAYERS Championship by four strokes, might have pumped that excitement level a little higher, of course. Perhaps a 12. Maybe more. Way more. And truth is, McCumber, then 36, would have had reason, given his accomplishment. In front of four generations of family members, McCumber — a Jacksonville native — didn’t just win any hometown tournament; he won a wildly prestigious one against the deepest and best field there was. McCumber had every reason to be emotional after a brilliant performance (65-72-67-69 for 15-under 273) to establish a new 72-hole scoring mark at THE PLAYERS Stadium Course at TPC Sawgrass. 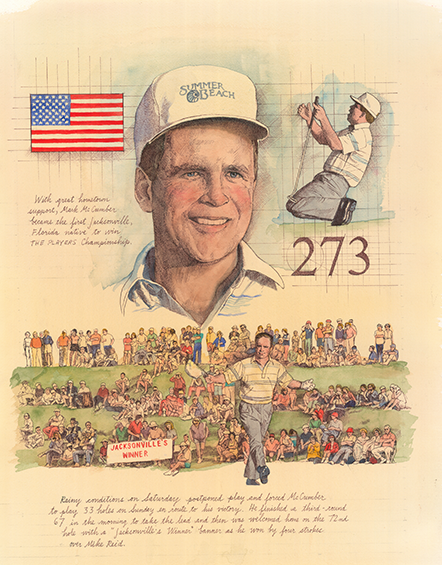 Though world-class players such as Greg Norman and Payne Stewart were within four of the lead entering Sunday’s final round, this was McCumber’s show. It was No. 6 of a 10-win career and at this point of the 1988 season McCumber had not missed a cut in and had been over par in just one of 23 rounds. Clearly, he was prime time. He was, as they say, “in form” and with the PGA TOUR’s showcase event sporting a first-place prize over $200,000 for the first time ($225,000, to be exact), one could say that McCumber’s timing was perfect. After all, he was home. Consistency was in order for Mark McCumber as the Jacksonville native claimed THE PLAYERS Championship 1988 in record-breaking fashion. Playing 32 holes on Sunday, 14 of which that were left over from Saturday’s partially completed third round, McCumber never looked like being beaten.